Progressing from ballerina, fashion model, actress and muse to acclaimed artist in her own right, Anh Duong's creative trajectory has been a serendipitous success. Born in Paris and relocating to New York in her mid 20s during the 80s art boom, Anh found inspiration in the energy and magic of the city and the art luminaries she was surrounded by including Julian Schnabel and Francesco Clemente. 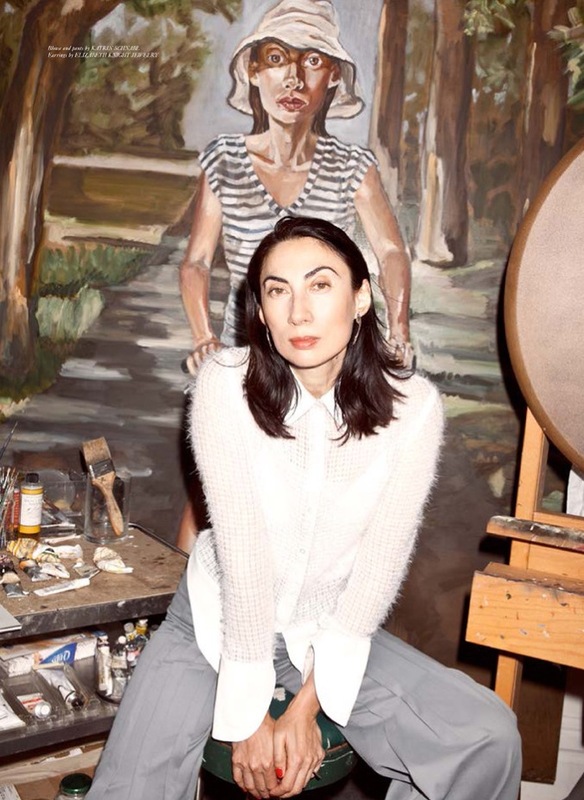 Best-known for her intimate self-portrait series that began at Andy Warhol's Montauk beach house decades ago, Anh has continued to express her "inner struggle" through her own image as well as that of revered women including Anjelica Huston, Susan Sarandon and Diane Von Furstenburg. Disarmingly honest and immediately likeable, the charming Anh Duong talked being a woman in a man's art world, the parallels between art and fashion and the joys of summer in The Hamptons with Indigo Clarke. RIKA: Hi Anh, where are you at the moment? Anh Duong: I’m in East Hampton, Long Island. During the summer I try to leave Manhattan and spend as much time as possible here. I have a studio in my house here as well, and the light is really amazing to paint in. I love the lifestyle it affords – to be able to go back and forth between swimming in the ocean and painting all day is wonderful, it’s such a nice place to be. RIKA: How long have you been spending summers in The Hamptons? Anh Duong: I’ve had my place in East Hampton since 2006, but the first time I visited The Hamptons was in 1989 when I spent the entire summer at Andy Warhol’s house in Montauk. It was such a beautiful house, he never spent much time there so he would often rent it out. So I spent my first three summers in New York there renting it with my boyfriend at the time, Julian Schanbel. RIKA: Did staying at Warhol’s beach house inspire you to paint? Anh Duong: It’s where I started painting, and it was certainly an inspiring place. It was at that house that I really decided I wanted to be an artist. I was modeling back then, and the decision wasn’t really a career move, more of a natural progression. Because I was with Julian at the time I was totally surrounded by art and artists, and he also really supported me becoming a painter, so it felt very natural to become an active part of that world. Anh Duong: Absolutely. When I moved to New York I was Julian’s muse, but I had always been an artistic and creative person. I had been a ballet dancer, then model and then an actress, and once I arrived in New York in my mid 20s I decided to take a break from everything for six months to figure out what I really wanted to do, who I wanted to be, what I was most passionate about. I came from being the muse and Julian being the artist to becoming an artist in my own right. I relate to the story of Man Ray and his muse Lee Miller, who went on to find her own voice and become a famed surrealist photographer. RIKA: With such varied creative interests, how did you decide on painting as your vocation? Anh Duong: Art – in particular painting – was always my passion, even when I was modeling. I modeled in John Galliano and Christian La Croix’s first shows and was so inspired by the artistic, couture elements of their designs. Fashion was very creative back then in the 1980s, it was more artistic somehow. While I was modeling, and for as long as I remember, I’ve painted. I never thought it was unique or special, I thought everyone drew or painted as a way to express themselves. I was also interested in performance – acting and dancing. The only thing I couldn’t do was sing, so I never tried to do that professionally! RIKA: Why were you so drawn to various types of artistic expression? Anh Duong: It was about experiencing and understanding oneself. Growing up, you experience difficulties and pain, and I found that art in any form acted as a great outlet. Thank God I had this talent and capability for expressing myself through art, it is a relief and absolutely helped me to understand myself and deal with whatever problems I had over the years. It is healthy to have this kind of outlet, to create a world for yourself where you are safe. Whenever I felt tormented I could release it through art, that is the importance of artistic expression for me. Anh Duong: It was strange to be a model, I never thought much of it really. I didn’t grow up having any interest in being a model, I actually felt like I was borderline exploiting myself when I started – you know, being a feminist and wanting to go beyond your physical appearance. It didn’t feel politically correct at the time. But I’m so glad I did it – I got to travel the world and meet the most amazing people. It was amazing to be able to dress up in incredible clothing, it was like a little girl’s dream come true, and it taught me to be able to express myself through how I dress. It lead me to come to New York and meet Julian – suddenly a whole new world opened up for me. RIKA: Living in New York during the 80s art boom must have been amazing! Anh Duong: I was 26 and I thought I was too old too old to start a career in art, can you believe it?! When you’re young you somehow always think you’re too old to try new things (laughs). I started painting at the most incredible time – to be in New York in the 80s was something else, it was booming. I experienced such an amazing way of living, surrounded by artists like Julian Schnabel, Francisco Clemente and Donald Baechler that were the stars of their generation and that would take me into their studios and share their way of working with me. I could barely speak English after moving over from Paris, I was absorbing everything around me like a sponge – new people, new attitudes, new world. The freedom of this lifestyle really appealed to me, and the way that these artists could communicate with so many people through their work was something I really admired. RIKA: You’re best known for your portraiture – particularly self-portraits – why has this been such a longstanding focus for you? Anh Duong: I was always interested in portraits and figurative painting. I used to paint dolls and little girls when I was young – it was a way to express how I was feeling without words. I found it very difficult to communicate as a child, I didn’t feel safe communicating my feelings, I think I just didn’t know how to in a way. Through painting I found a way to express myself. Anh Duong: I’ve definitely focused on the gaze, as it’s through they eyes you can express the inner workings of a person. In creating my self-portraits I was on a search to find myself – looking in the mirror at my reflection and finding something much deeper. People would often ask me, “why are you so obsessed with yourself,” after looking at my self-portraits, but I believe all artists create self-portraits. Whether an artist makes a sculpture, a painting or an illustration, to some degree it is a self-portrait as they are on the same search for self-discovery and allowing people an intimate glimpse into their minds. What I hope I’m offering through my work is an insight into what it’s like to be a woman and an artist, that the viewer can experience something together with me and we can connect. I’m using my image to express something universal; happiness, pain, sadness – emotions we all experience. RIKA: You’ve said you “always consider yourself an outsider”, having grown up in Paris to a Spanish Mother and Vietnamese father. How did this shape your world view and art making? Anh Duong: My parents married in the 1950s, at a time when it was very rare to be a mixed-race couple. It was quite an intense and heavy background to have growing up in Paris – my mother’s family had moved to France during World War 2 after the Spanish Civil War, and my father grew up in French Indochina and moved to France from Vietnam to go to University. It wasn’t an easy time to be accepted in France, and my parents both felt displaced. I grew up feeling I never belonged anywhere, but on the other hand felt I belonged everywhere – so it was quite a positive outlook. It was challenging but also a gift. I didn’t look like anyone else – I was tall, skinny and mixed race. I felt awkward and sensitive as a child and teenager, which was difficult, but it was a beautiful challenge and it inspired me to find creative outlets for my feelings. RIKA: Did you feel at home in NYC? Anh Duong: I felt comfortable straight away in New York because everyone has come from somewhere else. From the moment you set foot in this city, you become a New Yorker. This city has a magic to it, people come together and make a life here because there is such an amazing energy. No one cares if you’re born here – you become part of the city, unlike cities like Paris or London that can feel quite exclusive. I came to New York to reinvent myself. It was an evolution for me, a time to decide what I was going to do with my life and career. RIKA: Where in Manhattan do you call home? Anh Duong: I live in West Village in a beautiful space – it is actually the old home of Mark Twain, so it is very inspiring. Somehow living in this house makes me feel like I am back in Paris. I love that feeling because it makes me feel connected to Europe. RIKA: As a model and famously couture-clad young artist, did you find it difficult to be accepted into the art world? Anh Duong: I felt like I was trespassing back then, there weren’t the parallels between art and fashion that exist now. I felt I was a joke at first, there was definitely a lot of negativity at the beginning and I felt there was prejudice because I was a woman. For my first exhibition opening I wanted to wear couture and be feminine, but I knew I was expected to look like a guy to be taken seriously. Today a young artist will wear Prada and be featured in Vogue, but back then that would be seen as embarrassing. Vogue featured a six-page spread on me after my first show, and at the time it took me so long to agree to the interview because I didn’t know if it would be a good idea. I decided to do it because those rules just don’t work for me – I thought, ‘why should I look like a macho guy to be taken seriously?’ As a woman that was my battle. I’m proud to have stayed true to who I am – look how it’s changed today – art and fashion are so intertwined. RIKA: What are you currently working on? Anh Duong: I do a lot of commissioned portraits, though I mostly create self-portraits. I’ve painted my dear friend Diane Von Fursteburg and her son, Susan Sarandon and Anjelica Huston. When you paint someone it’s as though you’re looking into their soul, and the result is a mix of the artist and subject. I get to know the subject so well from the experience. When someone sits in front of you they want to tell you their whole life story, it’s very intimate like a patient with their shrink. It’s a beautiful way to connect to people, a beautiful encounter. RIKA: What are you most excited about at the moment? Anh Duong: I was recently offered a part in a film, which I’m really excited about. Years ago I acted in some French and American films, one of the best known is High Art. I quit acting after I decided to really focus on art, but I always enjoyed it and in the back of my mind would think about it. It was fantastic to be able to act again after 12 years – it was frightening and exciting and everything I could wish for. I have more respect now than ever for actor’s as it’s such a challenging craft. That was my latest adventure and now I’m excited to see what’s next. That’s what life is about, expressing one-self and finding different mediums to work with and worlds to exist in. RIKA: Do you find you’re more open to experimenting with new mediums as you mature? Anh Duong: I definitely find it easier to try new things now – I find this stage in life very exciting. As you mature you let your guard down and are more in touch with how you feel, so your work gets deeper and you can communicate with people in a more substantial way. Acting again, I feel like I am starting anew and reinventing myself, being creative and trying new things. The biggest compliment for me is when young women tell me I have inspired them or their work. It is a great compliment that young women feel they can relate to me, we all share that inner struggle and it’s what inspires me to keep creating and moving forward.